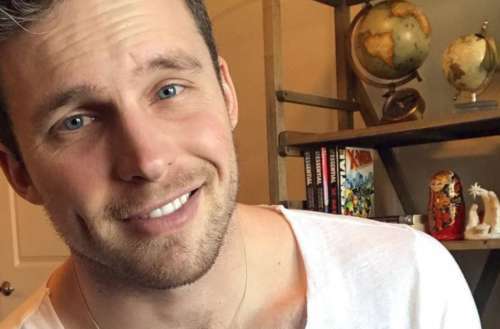 Instagram hunk Carson Tueller is going viral right now. Not just because of his good looks, but because of his powerful comeback story that is heartbreaking and hopeful at the same time. Tueller was a college student at Weber State University in Utah. Tragedy struck when while home for the holidays in 2013, he and his sister visited a trampoline park. I watched my little brother and sister tumble into the foam pit, and it was my turn. The foam was somewhat deteriorated and I could tell the pit needed to be fluffed. But assuming the park itself maintained its facilities, I tumbled from the trampoline into the pit, pulling the hardest front tuck I could mange, attempting my usual triple. I flew through the air, through the foam, and landed on the back on my head at the bottom of the trampoline, and then hit whatever was below that. I heard a crack. My neck stung. My body settled with the bouncing trampoline and I tried to get up. Nothing. Confused, I tried again. I couldn’t move anything. As I lay buried under blocks of foam, my dad came into the pit with me. “Dad, I think I’m paralyzed.” Paramedics were called, and as we waited for life-flight to arrive, I tried to comfort my father as he said over and over, “My boy, my boy…” I was flown to the hospital where I would undergo an immediate spinal fusion and begin the long road to recovery. I woke up EXHAUSTED. One thing that I still struggle to accept about my spinal cord injury is that I tire more quickly than before. Because I have to live the same life I did before with such a small set of muscles, I reach the point of exhaustion more quickly. . This came with a lot of grief at first because I used to run everywhere I went. I ran up the stairs, ran to the car, ran to class, ran, ran, ran. I was in good physical condition and rarely hit my limit. . My spinal cord injury has required that I be more strategic with my energy resources. It has required that I get more sleep and that I communicate what I need more frequently. This isn’t always easy for me, but it’s the only way I can accomplish what I want to in life. . I refuse to let paralysis determine how I live and what I can achieve. I’m grateful to say that I’m doing more than I have ever done, pre or post-injury. 2018 has already brought new duties and responsibilities that are challenging me, but I’m looking forward to meeting the demands of this upcoming year head on. Tueller is still on that long road to recovery, but he seems to be doing better than ever. 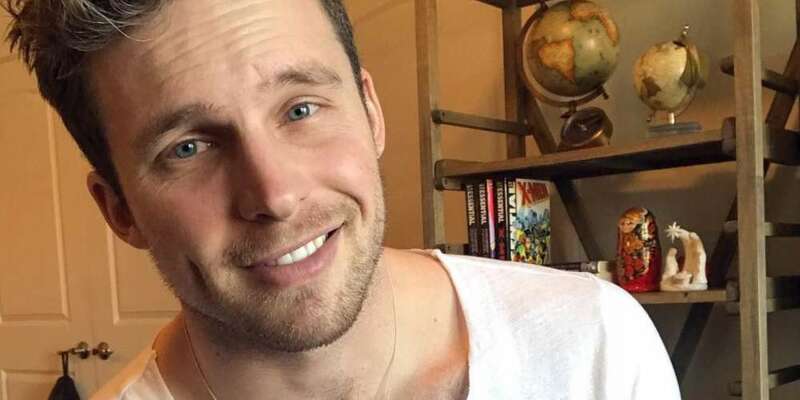 On Instagram, he shares adorable selfies of himself that would make any gay man gush, but he pairs his photos with honest captions about his daily struggle and the challenges he has to overcome. My life would never be the same. It’s been an arduous battle for the last four years, and I have been determined to recreate a life that I love for myself. I have, through tears and grimaces, refused to give up, not because it’s the brave thing to do, but because I just can’t let what happened that day win. I’m not done crying. I’m not done grieving. I’ll never, ever stop missing the life I had. But I’m still Carson, and I’m a stronger, smarter, more tender, loving Carson than I was four years ago. All along this journey, I’ve had love from others that has kept me alive and it’s that love I’ll keep leaning on to make it through whatever else is coming my way. To all those who have loved me through this, thank you. A jug a day keeps the doctor… well, happy with my calcium intake. ?? “The most beautiful people we have known are those who have known defeat, known suffering, known struggle, known loss, and have found their way out of the depths. These persons have an appreciation, a sensitivity, and an understanding of life that fills them with compassion, gentleness, and a deep loving concern. Beautiful people do not just happen” . -Elizabeth Kübler-Ross, Swiss-American Psychiatrist and developer of the theory of the 5 stages of grief. . Suffering rarely feels like strength to me. Loss has never felt like progress. But when I pause and look at what I’ve learned because of my pain, I see lessons and I couldn’t have learned through school or travel or any other form of education. . Grieving has taught me compassion, and loss has taught me be to be a fighter. I don’t like saying it, but in so many ways, suffering has helped me to become the person I’ve always wanted to be. I have 3 muscle groups I can work out: upper back, chest and arms. Period. In order to spread it out so I’m not doing the same exercises all week, I really spend time on all of the smaller muscles within those groups, and attempt to achieve total muscle fatigue in those areas (which doesn’t always happen, but I try). Today was shoulder day. ???? Staying up till the early hours of the morning are when I’ve had some of the deepest, most meaningful conversations with my closest friends. Going to sleep at 4:00 AM also makes for a very lazy Sunday morning. ? It wasn’t too long ago that I got a notification on my phone that said “Your package has been delivered”. I went to the door, got the package and immediately ripped it open, pulling out a simple quote matted on a brown background. I stuck in on my fridge without even bothering to frame it. I took a deep breath and read the words over and over. . I bought this wall hanging recently as a result of some difficult heartbreak. I was in a lot of emotional pain and was struggling to find any solace. I kept asking, “Does everyone feel this way? Why didn’t someone warn me that it was so painful?” . I spent my emotional resources trying to process and tease out all of my complicated emotions, and as I waded through the pain and anxiety, would often feel stupid or foolish for having fallen so hard for someone. “How could I have been so stupid?” was a question I often asked myself. . I was sitting with a heavy heart at my kitchen counter when I came across the quote on this wall hanging. I suddenly realized that I had done everything right. I showed up and put my heart on the table, and while someone had chosen to be careless with it, I was living consistent with my values. I was practicing courage. . I still read these words everyday, without fail. I remind myself that I value courage and that my heartbreak is only a sign of sheer bravery. Vulnerability can feel like a lot of things, but it is never weakness. . I no longer diminish myself for my heartbreak, nor do I blame myself for being caught up in love. I celebrate my capacity to risk. When I feel that familiar heartache, I gently remind myself that I’ll keep showing up, and keep being brave, because above all other things in life, I am committed to loving and being loved. To follow Carson Tueller on Instagram, head here.